I'm not a quitter. At least, I don't want to be a quitter. Who does? I try to stick with pursuits even when they are tough. Though, if I'm honest, when looking back on my earlier years, there were fixations/interests/hobbies I thought I would stick with forever but that eventually waned-- sewing, cross country, baking, tennis. There are other interests that may go on the back burner for years at a time, but that I always come back to (writing being one of them). As a mother of two young children, now there's the added twist of kid's hobbies. I love that my kids are finally old enough that we can try out classes together-- music, Spanish, soccer-- whatever seems interesting and fits into our schedule (without bankrupting us). I don't love the baby period much, and I think that is because I retreat into my hermitish nature too much when they are little. Learning new things and pursuing old favorites, however, is high on my happiness list. One of the first classes my daughter was old enough to try last fall was a Parent/Child dance class, for just half an hour, once a week. I jumped at it. It started well enough. I enjoy music and dancing and so does she. But over the last couple of months, my usually joyful, fearless little daughter was no longer participating. At all. Many times, she started crying, running out of the room, slamming the door behind her, and just basically acting out. Other times, she would treat us to a full-on tantrum. This behavior certainly stripped away any joy I could experience from the endeavor. Plus, truth be told, who wants to be the parent of the crazy, tantrumy kid every. single. week? I had hoped to make it to June with her. To stick it out for the full school-year. I kept telling myself it was just a phase or that she was having a bad day. Still, weeks later, things were only getting worse. I made a decision: we're quitting. I reasoned: It is no longer fun for us. She's getting nothing out of it. We are disrupting the other families who are participating. No more dreading the spring "show." You know what? The world kept turning. I don't get tense on Tuesday mornings at 9:45 anymore. My daughter might have a little more screen time now during that time, but she also has a mom who isn't frustrated at a class she clearly wasn't enjoying. I only wish I had quit when the going got tough with my highly sensitive son back when I attempted the classic "parent and child music class" when he was very young. It was way too much stimulation for him, and yet I tried to get us there every week thinking it was something we "should" do. To quit or not to quit? This time, I quit, and I'm glad. I'm relieved and I think my daughter is too! If only I had followed my gut with her older sibling when he showed all the signs of detesting music class as a toddler; Mom Guilt made me stick with that miserable class to the exhausting, bitter end. Of course I want to find extracurriculars that she loves and that I appreciate, but for now, we are taking a breather! Have you had any unsuccessful classes or experiences in an attempt to "enrich" your child's life? What did you do? P.S. Please consider supporting Frantic Mama and other bloggers by checking out our new anthology, Only Trollops Shave Above the Knee, available on Amazon, iTunes, and Nook! Boredom! How did I not think of that as the culprit? Just like your son's soccer group, things started well and got worse-- maybe she was simply bored. Either way, whew, I'm glad to be done! Oh, and I don't really think my daughter is a "quitter"-- if anything, I was the one trying to stick with it but in the end decided it was best for everyone to bow out :). It was no longer fun at all! And "fun" is what activities are supposed to be with a toddler, right? It's not like I expected her to turn into a professional ballerina from it! I just wanted one mother-daughter thing we could do together. Clearly, this wasn't it. I'm so glad for you, however, that music class is going well. 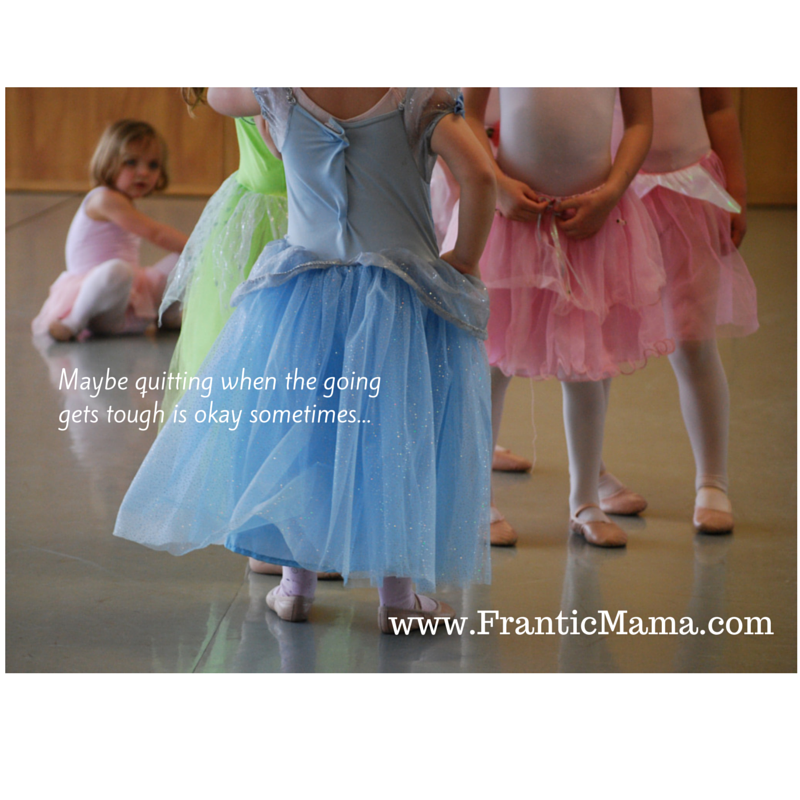 Music class was very rough for my highly sensitive son when he was young, so we also had to quit because of the stress. Years later, he can now often handle that sort of thing, which has been great. You are right-- they are young-- there's plenty of time.